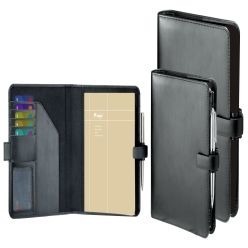 Leather Folders are an ideal gift for exhibitions, conferences, and corporate events. They are super effective in promoting brand awareness and are practical products for any user to store any sort of reading material. While many think of them as an obvious choice for promotional products, it is surprising how people tend to forget about them. They are always in one's easy view at an event. Our Moncha A5 leather folder is specially designed for in hand convenience. If you're going to be running around managing and organizing an event then this is exactly what you need. 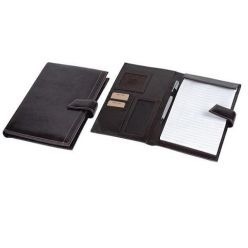 This leather folder is made with Italian Veg leather, has detailed stitching, and is delivered with a notepad in a gift box. The casing is elegant enough on its own so you don't have to wrap it up in any glitzy paper or ribbons. The other folder includes multiple card pockets, a gusseted filing pocket, and two pen loops. This too is delivered with an A5 notepad inside. This simple yet thoughtful gift is always a hit and much appreciated by the receiver.